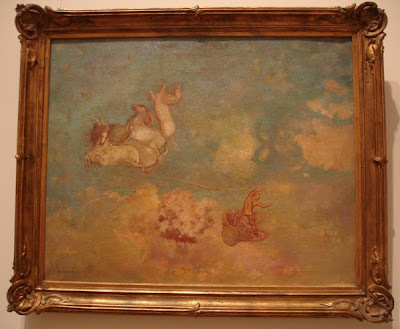 Aside from being beautiful, these pieces by French Symbolist painter Odilon Redon, bear historical significance as a bridge between Impressionism and Modern Abstract Expressionism, no doubt leading into Surrealism as well. The Chariot of Apollo (above) and Pandora (right), struck me with their interestingly rudimentary line quality, their representational forms, and colorful yet muted palettes. 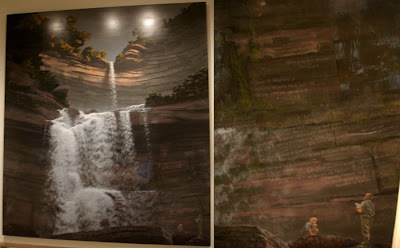 Looking at them, I can't help but think that these are still frames of dreams, translated onto canvas. I took a little train ride up to New Haven, CT to visit a dear friend, who is attending the MFA in theatre program at Yale (I know, I'm so proud of her!). So I got to see a really interesting performance of Hamlet last night, which was itself a work of art with colorful costumes and an artistic perspective on the Shakespearean classic. 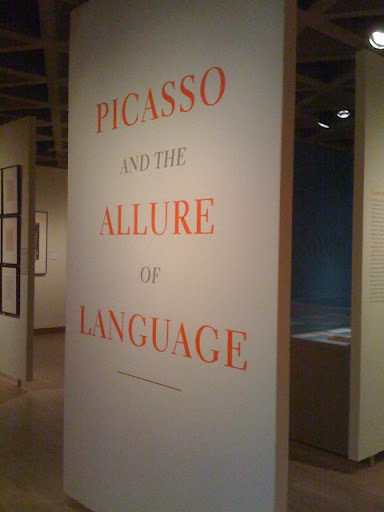 And this morning, my friend and I ventured to the Yale Art Gallery to see the Picasso and the Allure of Language exhibition. In the past year of my growing interest in art museums, I have come across a handful of exhibitions featuring books, works on paper, and literary contributions by well-known artists. This was another gem to capture my love of the written word and visual art all rolled into one. Picasso's illustrations, book covers, and poetry provide a new facet to the prolific artist's illustrious career. To see physical proof of the constant workings of his mind and his collaborations with other artists was wonderful. 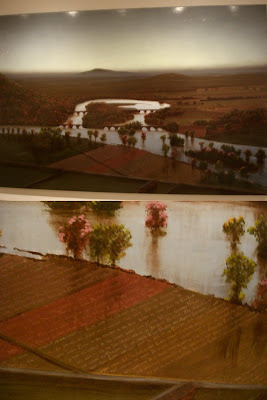 I especially enjoyed his handwritten poetry — the words on the page are beautifully arranged works of art in themselves. There were also illustrations for several texts; my favorites were line drawings of Greek mythological subjects. Though small, this was a well-designed world-class exhibition — as could be expected from the Ivy League. 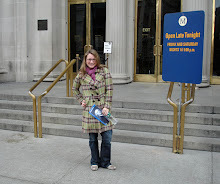 I just had my most disappointing experience at the Met to date. 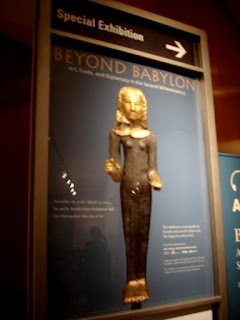 As usual, I waited til the last minute before the special exhibition, Beyond Babylon: Art, Trade, and Diplomacy in the Second Millennium B.C. closed — and I didn't leave myself nearly enough time to take in this incredible experience. 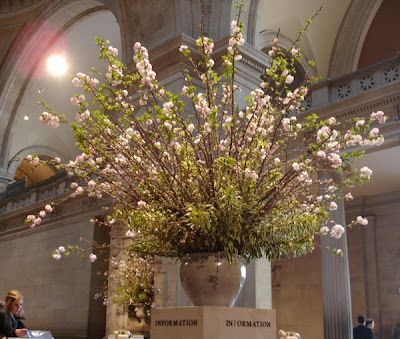 It was hands-down the best exhibition design I've seen so far at The Metropolitan Museum of Art. I stepped through the threshold and clicked on my iPod, playing Sublime's "Rivers of Babylon" (yeah, I'm pretty cheesy). But really, I loved every step I took through the galleries with huge aerial photographs of the region on the walls and the surprise of turning a corner to find a giant ship containing artifacts recovered from the sea off the southern coast of Turkey. Breathtaking is my best descriptor for the experience. I wish wish wish I had known how intriguing this was! For videos of curatorial talks, click here. In the far corner of the American Wing, just before you get to the portion that is closed for renovations, you'll find the recently reopened Living room from the Little House, Wayzata, Minnesota, by Frank Lloyd Wright. 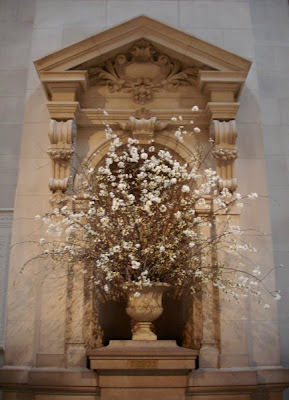 A true gem of the Met's decorative arts collection, this room is more than just the furniture it contains — it is an intact piece of architecture by the 20th century's most significant American architect. Though the style is now dated, we have Wright to thank for his cutting-edge attention to geometry that continues to inspire contemporary architects. 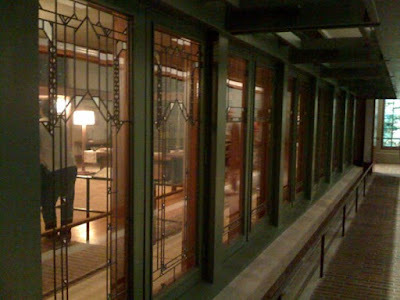 Before entering the room, you walk along the exterior, peering into the space through Wright's signature stained glass windows. After a weekend hiatus from the Met, I made no plan for today, intending to just enter the museum and see where it took me. I didn't go far after ascending the stairs from the 81st street entrance into the Greek and Roman galleries - I just sat down by the fountain and continued reading Making the Mummies Dance; and, of course, engaged in a little people watching. 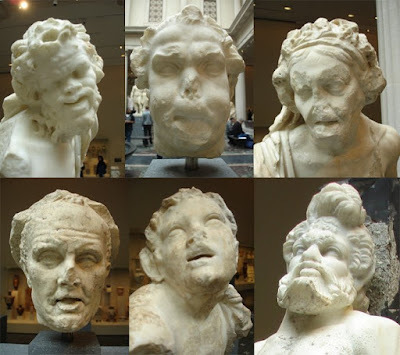 I was really into the faces of the sculptures, which in some cases are just heads. I find that the damage to the features makes them look a little ghastly, but ultimately adds to the beauty of their survival from antiquity. There was also this cute little vase that reflected so nicely on the glass below it — I just had to snap a photo. It was a LONG weekend - pretty much worked nonstop... but before I did, I got the chance on Friday to visit the Met with a couple friends that were in town from California, one of whom hadn't been before. 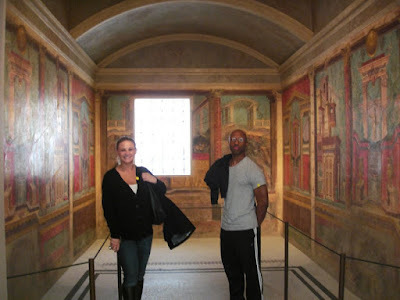 Stephanie and Jerrell posing in the "cubiculum," or early Roman bedroom. 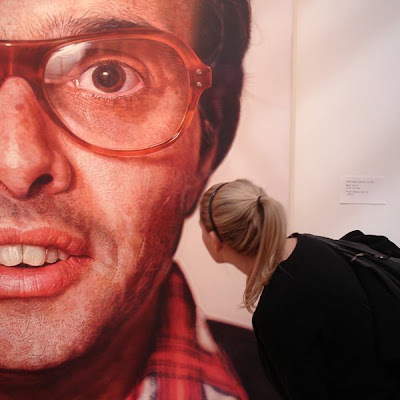 Stephanie up close with Chuck Close. The music reverberated through the space like a combination between a harp, piano, and guitar. 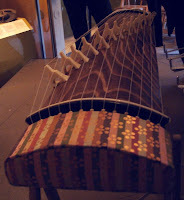 I got the feeling that I had stumbled upon a treasure only for those in the know — even I had only been to the musical instruments wing once, but you can bet I'll try to make it to the next concert: Music from a 400–year-old continuous living tradition—Norway's hardanger fiddle. It was the perfect day to go to The Cloisters, the Medieval branch of the Metropolitan Museum of Art. 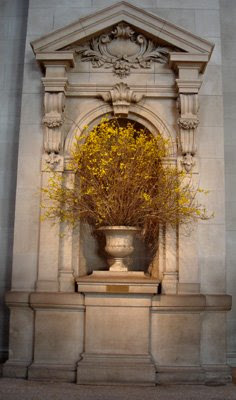 Perched high above the buildings on either side of its hill in Fort Tryon Park, with a view of the Hudson River and George Washington Bridge, the exquisite museum is built in the style of a monastery, incorporating beautiful architectural pieces from historic sites. Within its walls, you'll find intricately detailed tapestries, paintings, and artifacts from the middle ages. 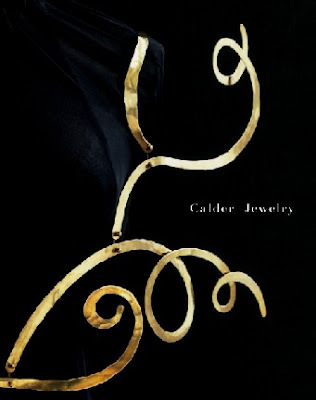 Calder Jewelry ended today, and though I have meandered through several times, I never wrote a post on it (not at all because it wasn't interesting). Alexander Calder is a well-known sculptor and painter, whose lesser-known metal jewelry takes on natural forms — elegantly crafted but with a rudimentary air. While the jewelry is stylistically similar, there are still a wide variety of modern-looking pieces and ones that reflect on traditional Egyptian, Greek and Byzantine jewelry.